Harry Potter author JK Rowling spoke at Harvard University recently and offered some powerful, heartening advice to dreamers and over-achievers. She also talks about one hard-won lesson that she deems was worth more than any qualification she ever earned. Within five years, Rowling has made $980 million and sold 400 million copies of her books. Typical woman. A northern beaches reader just emailed this snap that they captured as they drove home early yesterday evening. "I'll start with the good news, or I should say the best news, as there isn't any bad news today," writes 16-year-old Sunshine Coast sailor Jessica Watson, as she marks another milestone passing South Africa's Cape of Good Hope and onto the last stretch to the West coast of Australia, the Atlantic Ocean and into the Indian Ocean. Watson is almost on the home stretch, sailing solo and unassisted around the world. "Now only 120nm till we pass under Cape Agulhas (I've been saying the Cape of Good Hope but the most southern point of Africa is actually Cape Agulhas) and can officially tick off another Cape," Jessica wrote on her blog on Monday. "The wind dropped off a little today and with it Ella's Pink Lady's great pace too. But we are moving nicely still and for the first time in over a week it was warm and sunny. After misty drizzle and grey skies for so long, sunshine feels particularly lovely! As there's a high pressure system passing over us at the moment, it looks like the calm sailing (fingers crossed that it's not too calm!) will last for a while yet." Jessica is around 1,500 nautical miles ahead of where her team thought she'd be at this stage. She's expected to arrive back in Australia early May. Check out her videos here. "Can this page getter a better reception than Win TV can in FNQ?" is the name for a new anti-fan page on Facebook, the world's most popular social networking site. "Damn you Win TV. You f**ked Top Gear. You f**ked the cricket. You f**ked the Winter Olympics. 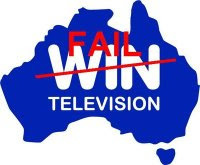 Liars and Bastards," so reads the introduction attacking regional WIN TV, who have been plagued with transmission problems over recent days. The page, set up today, only boasts 46 fans, however that is sure to grow. It miffs me why people bother with commercial TV these days, what with its mash of un-reality shows, regurgitated wall-to-wall American crime shows, and bland news coverage. I thought that's why DVDs and the movies had such a resurgence. Labor is under attack in the Queensland parliament, as the opposition marks 'achievements' on their one year anniversary since the election. "They mark bringing in the fuel tax, increased car rego, increased taxes, electricity charges... the list goes on," David Gibson, member for Gympie says. Here's Charlie Brooker on BBC's Newswipe telling us how they make a news clip. Rather perceptive. 24. Don't compare your partner with others. "I will lend you, for a little time, A child of mine, He said. He'll bring his charms to gladden you, And should his stay be brief. But should the angels call for him, Much sooner than we've planned. - Elliott's mother Brigitte Fletcher, reading from Edgar Guest's poem A Child of Mine, at today's memorial funeral service in Brisbane. 12-year-old Elliott Fletcher was given a send off today, with 2,000 people at St Patrick's College. John Lennon's touching song Beautiful Boy, was played. Elliott was stabbed to death at school on Monday. Elliott's death was a result of bullying. Every year young children and teens, many around Elliott's age, commit suicide from bullying. Often such bullying often goes on and not dealt with. It becomes the behaviour that these people take into their adult personal life and in work life, as managers, as parents, lovers and even mates. Bullying manifests itself by people not respecting different viewpoints, encouraging hate, and intimidatory behaviour, and verbally or physically ganging up for some invisible power fix. An example of this was when Kim Freebody, partner of waterpark developer Paul, got behind a hate website against Cairns Mayor Val Schier and enlisted her children to fall in behind the campaign. It's one thing expressing differing political opinions - a healthy discourse in a free society. However Cairns teacher Steve Brech said that Kim Freebody's involvement was tantamount to the promotion of on-line bullying, a serious problem that can lead to tragic and violent consequences. "The fact that she professes to be a Christian, and non-political are merely signs to her state of mind," Brech told CairnsBlog. "She is an adult with many years experience of conducting relationships with teenagers. To set this sort of example as an acceptable way to behave sends the wrong message to the thousands of teenagers viewing life through the prism of an on-line world." In Queensland, there is a substantial black list of schools that have reported acts of violence, threats and abuse, with at least three recorded incidents at Cairns State High school. According to Education Queensland documents, schools with more than 200 student suspensions in 2008, based on information released in July last year. Short term suspensions are 1-5 days and long term suspensions are 6-20 days. The survey also listed the figures for suspensions with recommended exclusion. Here's an interactive map showing affected schools across the State. Michael and Rose, along with four others, went along to Ristorante Rimini in Lake Street, Cairns on Sunday night. "We thought this may be of interest to your readers. Here's a brief description of our disgusting experience on Sunday night (14th February)," Michael Cermak writes to CairnsBlog. As Cairns locals, they were concerned about the current slump in tourism, and therefore this extraordinary dining experience highlighted the need to weed out establishments such as the Rimini that give such a Cairns bad reputation. "After downloading the menu from their website and checking their credentials on MenuLog, we booked a table for six to enjoy the authentic Italian cuisine," Michael and Rose wrote to CairnsBlog. "When we arrived, we opted for the buffet, which also supposed to consist of Italian dishes. To our surprise, the buffet wasn't Italian at all, instead it was composed of boring old roast and veg which didn't look very appetising, so we decided to go back to the table and order from the menu." They say that they were ignored by the staff for a long while, and the stressed looking headwaiter announced that "there is no menu tonight, buffet only." "Having no other choice, we tucked into the lukewarm meats and overcooked vegies. The advertised entrée consisted of bread rolls with no butter and the deserts were disgusting," they said. "For example, the Apple Crumble was made of a thin layer of apples straight out of a tin covered with three times as thick layer of crumbs. Was there supposed to be a free coffee / cappuccino? Can't remember now." They brought their own wines because the 'ristorante's' webpage states that $5 corkage per person applies. "One would assume that the corkage applies to BYO, not the wines served under their licence, however when we asked for wine glasses, the well-informed waiter told us that they have never been BYO. "So we asked for some water instead, and the same staff pointed his finger at the bar saying "there it is, help yourselves". They summed it up by saying that the food was about two notches down from ordinary. "The choice of meals and service was none and the appallingly arrogant attitude of the headwaiter just topped it up," Michael and Rose said. "We paid $22 per head for what can be best described as a "country pub meal" and left without leaving a tip. No riminising about this ristorante," Michael and Rose said. A full list of restaurants around Cairns can be found at Cairns Dining, where you're invited to leave feedback. Cairns Regional Councilor Diane Forsyth has told Cairns Police today that she will proceed with a formal assault charge against the vice president of Cairns Community Radio, Pieter Blaauw. "I was treated awfully and this type of behaviour and aggression is equated to what women put up with in a domestic violence situation," Diane Forsyth said on the night of the January 6th meeting at the Raintrees studio. Cairns Police have confirmed, following interviewing a number of witnesses that there is sufficient evidence to proceed and apprehend Mr Blaauw. The president of the community radio has remained silent on the incident, and has ignored several formal letters from members to bring Blaauw to account and explain his actions. There have been calls for Mr Blaauw to step him down, pending the assault investigation. Although Diane Forsyth reported the assault to the Police promptly, three weeks later Rodney Coutts, in an attempt to retaliate, sent a letter to one of the members saying that he verbally threatened "to thump" Mr Blaauw that same evening. Coutts said in his letter that he will seek to terminate his membership. A current ACMA investigation is investigating Coutts and his mass rejection of memberships, among other issues. It is expected the Mr Blaauw will receive a visit from Cairns Police in the next couple of days. He remains on air to this day. The Cairns Regional Council will spend $22,000 on "an experiment" by planting four trees according to a Silva Cell tree root management system. The plan is to nurture shady street trees that will allow large trees to thrive side by side with maximum car park spaces, under a trial as part of a future plan for cool parking in the city heart. The four trees under the trial are on Hartley St, between Grafton and Lake, and will commence next week. "The tree root management system is an underground cellular structure designed to carry traffic loads while providing uncompacted area for tree roots to grow," Council's manager of Infrastructure Management, Stephen Tyter says. “The purpose of installing the system will be to allow large trees to grow providing large trees that offer shade in the Cairns CBD without reducing available parking,” Tyter said. The Silva Cell system consists of underground modular framework with structural standards that allow it to support loads of up to 20 tonnes. “The system provides the tree with access to a suitable volume of uncompacted soil which is critical in growing large functional trees in urban settings and will add perhaps twenty years to an average tree’s longevity,” Stephen Tyter says. Council says that planning for large shady trees in the centre of a city is designed to reduce heat in the urban environment which can lead to reduction in air conditioning subsequently saving energy costs. What an amazing revelation. Why don't they start by digging up the concrete in City Place and pop in a few of these trees? Birch Carroll and Coyle cinemas couldn't even spell the name of the film on the tickets correctly, nevertheless, the film adaptation of 1990 musical Bran Nue Dae, released two weeks ago, is a spectacular, engaging and moving piece of performance cinema. The story, set and filmed in Perth and Broome Western Australia, and almost everywhere in between, tells the story of a rebellious teenage Aborigine lad who escapes from a Catholic mission. If you want a feel-good movie with wonderful non-cringe musical numbers, that does an even better job than Priscilla Queen off the Dessert, then you'll be laughing and feeling for a culture in ways you never dreamt with Bran Nue Dae. The Aussie casting is superb with Geoffrey Rush, Magda Szubanski, Jessica Mauboy, Ernie Dingo, Tom Budge, Deborah Mailman and Missy Higgins. Even band leader Dan Sultan, as a former Cairns State High lad, does a fine job. Mauboy and Higgins had their film debuts, along with 15-year-old Broome local, Rocky McKenzie, who plays the lead character Willie with charismatic fervour. In a striking resemblance to the story, McKenzie says he was going to attend a Catholic boarding school in Perth. "Yeah, I got a couple of scholarships, but, I didn’t really wanna...." Rocky McKenzie says, who has praised working alongside Oscar winner Geoffrey Rush and a raft of experienced actors. "They didn’t really show us off, I would say. So that was kind of them. A lot of us non-actors kind of saw them as mentors." Bran Nue Dae, which features 21 songs, made the lineup for last month's Sundance Film Festival in Utah. Both Margaret and David from ABC's At the Movies awarded four stars. "The word that you think of when you come out is exuberance. It really is a fun ride to the cinema, and it just adds to the amount of indigenous cinema that's coming lately," Margaret Pomeranz says. There are some stunning moving moments that depict a culture in trouble and the bridges between white and coloured Australia often in a confronted, yet in a warm, enlightening and funny way. It's hard not to be moved by Rachel Perkins' screen adaption. You'll even get to see the Frank Djirrimbilpilwuy's Yolngu gang perform Zorba the Greek, who became famous on the net a couple of years ago. All those Avatar movie-goers, should do a stock take and reward themselves with this rich cultural experience from our own back yard. It seems the Kiwis, of which I'm one of em cobber (chilly bin, fush n chups, pavlova, marmite, Russell Cr...) dislike their national flag as much as their neighbours across the ditch. Back in 2004, a group launched a campaign to change New Zealand's flag, however they failed, mainly because we underestimated the huge effort required. "We failed to communicate the aims, objectives and benefits of the campaign to the largely apathetic, but often defensive masses," the co-ordinators say. "Five years later we believe that the underlying issues have not changed." They say that New Zealanders are still not emotionally connected to their flag, and are still dissatisfied with its design and with what it represents. The debate is the same in Australia, and rears it's head every Australia day. 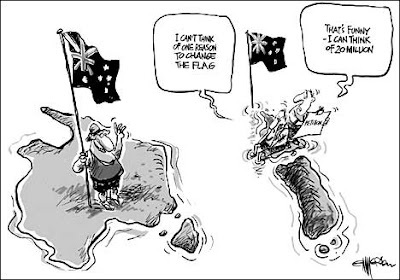 The fact remains that the current Aussie and Kiwi flag is a colonial emblem which does not well represent the way many feel about their respective country, its history or its future. "It doesn't reflect the way we see ourselves nor the way we want others to view us," the team behind the new New Zealand flag say. "Yes, it's a huge task to get New Zealand's flag changed but hey, it's worth having a go." Flags should be highly visible symbols of a nation’s presence. Because the current Union Jack-based flag does not resonate with New Zealanders, it is comparatively infrequently flown. Its uses are mainly confined to official buildings and occasions. A visit to any town in America or Switzerland, for example, shows what happens when a flag is a potent emotional symbol. The New Zealand flag needs to have emotional and symbolic potency in order for it to be embraced and used by New Zealanders. Test after test shows that the current New Zealand flag is immediately confused with flags of other countries, especially Australia. In many instances, a flag is used in an international context. There is no question that the Silver Fern is the most recognised symbol of New Zealand. For over a century the Silver Fern has been the emblem of our sports men and women. The Silver Fern is used extensively as a symbol by Government, tourism, trade organisations and commercial brands. The Silver Fern says "New Zealand". New Zealand competes with other countries, cities, and commercial brands. Countries with the strongest, simplest flags tend to have the most cut-through impact. Today, commercial brands command greater recognition than most flags. As an export country competing on the world stage, we need our flag to be strongly competitive from a brand/ symbol/icon point of view. The heart needs to beat faster on sighting of our country’s flag. The Silver Fern is etched in the memory of great victories by the All Blacks, our runners Jack Lovelock, Peter Snell and John Walker, the rowing eight from Munich. The Silver Fern conjures up emotions of grit, guts and genius. It says, "take on the world ­ and beat it". These are emotions we need to encourage. The Government is committed to best practice design through the Design Industry Task Force. Great design is a feature of New Zealand’s creativity. From the founder of modern industry design practice, Joseph Sinel, through to Lord Of The Rings, our design standards have been world-leading. Our flag needs to match this standard. In today’s environment the current Union Jack-based flag is simply bad design, poorly composed, a muddle of ideas, thematically derivative and unoriginal. Some leading newspaper editorials have called the current flag "an absurdity." The Silver Fern has been a feature of our iconography for well over a century. The All Blacks made it their official emblem in 1893. It first appeared on an official New Zealand flag in 1908. The Silver Fern was the predominant badge of our army in World War I, and the official insignia of the 2nd New Zealand Division in World War II. Changing from the Union Jack-based flag does not depreciate the sacrifice of men and women soldiers who fought in two world wars. Their efforts are recognised through permanent memorials in every New Zealand town, and through the commemoration of Anzac Day each year. The job of a flag is to instantly signal the country of origin in the simplest, quickest, most potent manner. This means utilising a single powerful image rather than several elements and thereby diluting the potency of the symbol. There are many mediums for embroidering the layers and textures of our story ­ from a Coat of Arms through to art and music. The job of the flag is visibility, instant recognition and emotional cut-through. Our belief is that the stylised Silver Fern does the strongest job of satisfying the greatest number of New Zealanders at any one time. Symbolic change has been a feature of the governmental environment, with the scrapping of the Privy Council, the establishment of a New Zealand Supreme Court and the abolition of knighthoods. A new flag is not advocacy for New Zealand to become a republic (many commonwealth countries do not have the Union Jack in their flag). A Silver Fern-based flag blends our past, our present and our future into one emotional symbol. A new flag gives energy and a sense of independence and self determination in this new millennium. There's many great designs for a new flag for our neighbourly dole-bludgers. ABC Far North's Ginger Gorman made the besieged president of Cairns community radio squirm live on air. Rod Coutts was asked on a number of occasions about why he rejected a number of new memberships, however he refused to disclose, giving the excuse that there was a current ACMA investigation on and he was told not to discuss. It's another lie from Mr Coutts, who has divided the organisation, almost beyond repair. ACMA actively encourage open membership, and it is a practice that they clearly ruled in breaches against the former Arona-dominated committee. Now Coutts has been up to the same controlling tactics in order to stop anyone speaking out against him. Coutts also talks about placing blame on the previous committee, but the movement against him is centred around his activities since the AGM last September. Last week, the Friends of Cairns Community Radio, 4CCR, was launched with Councillor Diane Forsyth and Ross Parisi. Forsyth's membership to the station was thrown out in the corridor, along with 14th others by the vice president Pieter Blaauw, moments before he physically assaulted the Cairns Regional Councillor on January 6th last month. 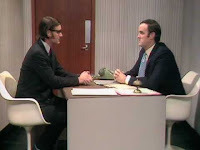 It is now known that Rodney Coutts instructed Blaauw to turf the membership forms, along with money, out of the meeting room. Here's Ginger Gorman on ABC Far North interviewing Councillor Diane Forsyth and Ross Parisi, chairman of the newly-formed Friends of 4CCR. Late last week, Ginger Gorman extended the invitation to Rod Coutts to explain his actions over the last four months. Listen out for another big lie, where he claims that he's signed up 83 members since he took office, and claims it as an endorsement of his management. In fact these were all signed up as a result of the move to throw out the former corrupt committee of Arona. Coutts has in fact rejected and terminated membership at a greater rate than any previous committee over the last 10 years. He also says at a presenters' meeting last week he received 100% support. He failed to mention that up to 15 presenters have walked out due to his behaviour and in fact, some left during thew meeting he refers to. Rod Coutts also repeated another outright fib on ABC Far North that the Arona-committee had done nothing wrong. It's shocking radio. I might drop off a lie-detector for Ginger to use on Coutts if he's ever invited back. On 14 December 2009, New Zealand's National-cabinet, recognised the Māori (Tino Rangatiratanga) flag, and said it will complement the New Zealand flag. 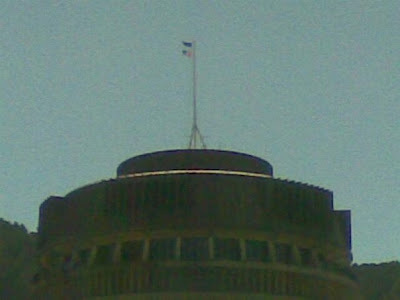 Today, Waitangi Day, both flags fly on top of the Beehive, the executive wing of the New Zealand Parliament in Wellington. A 29-year-old Westcourt man was charged with a number of drug offences yesterday afternoon following a disturbance. Police were called to the Mann Street unit shortly after midday in relation to a disturbance during which the man sustained a wound to his thigh. A search of the unit allegedly revealed a small hydroponics system in one of the bedrooms with three plants. The man was transported to the Cairns Base Hospital for treatment to a minor injury and was arrested upon release. Detectives charged the man with production of a dangerous drug; possession of a dangerous drug; possession of property used in the commission of an offence and possession of a drug utensil. He is due to appear at the Cairns Magistrates Court on February 18. Workers at a Parramatta Park school construction site located an old revolver whilst conducting earth works at the school on Wednesday afternoon. The weapon was buried approximately a meter underground and appeared to have been there for several decades. The weapon was considerably rusted and it appeared that the barrel had been modified in order to render the weapon inoperable prior to being buried. Police do not believe that the weapon presented any danger to students at the school due to its modified state and location deep under ground. A 37-year-old Freshwater man was charged with driving whilst under the influence of liquor early this morning after he crashed his Toyota station wagon into roadside signs on Brinsmead-Kamerunga Road. Police were called to the incident at about 1.00am and will allege that the man returned a breath alcohol reading of 0.178%. He is due to appear at the Cairns Magistrates Court on February 22. Smithfield Police were called to a single vehicle traffic crash at about 6.15pm yesterday at the Kewarra Beach roundabout on the Captain Cook Highway. A 40-year-old Kewarra Beach man received arm and head injuries when his northbound Holden utility crashed whilst he attempting to negotiate the roundabout. The man was transported to the Cairns Base Hospital for treatment and police are awaiting the results of a blood specimen. A 22-year-old Earlville man was intercepted by Edmonton police early yesterday morning after allegedly exceeding the speed limit along McGuigan Street at Earlville. The man was intercepted and a subsequent breath test allegedly returned a breath alcohol reading of 0.136%. The man was charged with speeding, drink driving as well as contravening a late night driving restriction. He is due to appear at the Cairns Magistrates Court on February 25. Edmonton Police are investigating the unlawful use of a motor vehicle overnight on Wednesday. Thieves gained entry to the utility which was parked in the carport of a Tiffany Street address. The vehicle was then pushed onto the street where unsuccessful attempts were made to get it started. The offenders fled after being disturbed by a passing motorist. A next door neighbour also reported the theft of his wallet and a backpack which had been left on a patio table outside his house. Police are urging residents to avoid leaving valuables in and around patio and entertainment areas in order to avoid becoming an easy target for thieves. Mossman Police are investigating the theft of a quantity of equipment from a Cow Bay property during recent weeks. The property owner had been absent and had returned to find generators, batteries and tools had been stolen from the residence, north of the Daintree River. In a separate incident, a retail business in Mill Street Mossman was broken and entered after thieves forced entry to the front of the store. A quantity of jewellery was stolen from the premises. It is believed that the offence occurred sometime between Monday and Thursday of this week. Detectives from the Mossman are investigating both offences. Today was the hottest February day in Cairns since 2002. 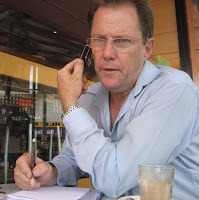 Yesterday I learnt that Greg Jarvis, whom I met during the March 2008 council election campaign, passed away suddenly. 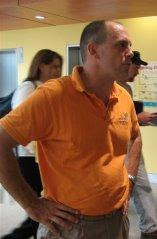 Soon after he returned to Darwin following the Queensland local government elections, Greg was elected as the first Green councillor to the Darwin City Council. I travelled with Greg, when he came down for the last weeks of the campaign, when we visited the Port Douglas' Chamber of Commerce luncheon. He was a real gentleman and such a grounding support at a time when there was the usual pre-election chaos. Jarvis was a close friend of Cairns Regional Mayor Val Schier, and helped with her election campaign in 2008. Schier says that Darwin Council is reeling at the shock of losing one of their most active and well-liked councillors. "I have just found out that my good friend Greg Jarvis, who helped us out for the last week of the Cairns 1st campaign, died unexpectedly last night after playing a game of soccer with friends," Val Schier said. Jarvis' death was suspected to be a massive heart attack. "When Greg went back to Darwin after the Cairns' campaign, he got himself elected to Darwin Council as the first-ever Greens councillor," Schier says. "He had just returned from an overseas holiday with his wife Trish and only daughter, Thea.," Schier says. "I saw him in Darwin last October full of life, enthusiasm, positivity and energy; a wonderful friend, father, teacher, mentor, role model, inspiration," Val Schier recalls. Before moving to the Northern Territory, he worked as a engineering surveyor in New South Wales. Since 1980, Jarvis has been teaching in the Territory. You know you're in a parallel universe when a bunch of fluoride-invested locals start to yearn for the first black man to ever visit Port Douglas. Obama for Port Douglas is a new group on Facebook with 545 "fans." They are trying to lure the leader of the not-so-free world Barack Obama, to a place that many in Cairns call Port Uglyarse. Cairns Regional Mayor Val Schier says that Port Douglas is is the jewel in the crown of Tropical North Queensland. "How can Obama resist? Hopefully Bill Clinton's been in his ear and has told him how wonderful a holiday in Port would be," Schier says. Even Queensland Premier Anna Bligh, in her most un-asset sale press release to date, jumped on the Obama bandwagon. If he does trek north to Cairns next month, and take a sharp right-hand turn out of the airport to avoid the Kevin Byrne Memorial City Place, he will join other yanky A-listers like Matthew McConaughey, Bill Clinton, Jerry Seinfeld, and even Alecia Beth Moore. Oh, and that Kiwi phone-thrower, Russell Crowe. I think if he gets his young men and woman out of Afghanistan and Iraq this year, it will be a better achievement than walking along Four Mile Beach spotting the sediment run-off into the Great Barrier Reef. Launch of ‘Friends of Cairns Community Radio’ today at 11am - marks need for urgent reform. Local community radio needs radical reform, say Cairns Regional Councillors Linda Cooper and Diane Fosyth. They will join former Mulgrave Councillor Ross Parisi this morning to launch ‘Friends of Cairns Community Radio’ at a media event at 11am. “The launch of ‘Friends’ is the community’s reaction to the serious administrative turmoil that has engulfed our local radio over recent months,” Ross Parisi says. “The events over recent months and years, has shown that there is an urgent need to have fundamental and constitutional reform for what should be a wonderful and inclusive community asset. It has a long way to go to meet that,” Parisi says. “This is a great opportunity to get involved and I hope that everyone with an interest in community radio, joins the 'Friends' group, that is proactively working towards turning this organisation around.” Cr Linda Cooper says. Councillor Forsyth, whose membership was rejected by the Association along with 14 others this month, following an incident when she lodged an assault complaint against the station’s vice president, is seeking urgent change in the community radio station. “The ‘Friends’ will draft a Memorandum of Understanding that will form the basis of any negotiations between the current radio management. The purpose of this document is to indicate to all interested parties that the negotiations will be conducted in a spirit of goodwill,” Ross Parisi says. "We have invited the current station management, along with Councillors and look forward to a new era in community radio starting," Ross Parisi says. Membership of 'Friends of Cairns Community Radio' is open to everyone interested in helping achieve the objective of an open, community-based radio station.